The lineup of guitar slingers on this five-CD package is enough to make any blues-rock devotee start foaming at the mouth: Peter Green, Eric Clapton, Gary Moore, Mick Taylor, Billy Gibbons, Otis Rush, Steve Miller, Walter Trout, Jeff Healey, Steve Cropper, and Jonny Lang. Such is the pull of John Mayall, the legendary British blues vocalist, keyboardist, and harmonica ace. As a bandleader, he draws more killer string benders than a Les Paul tribute concert. 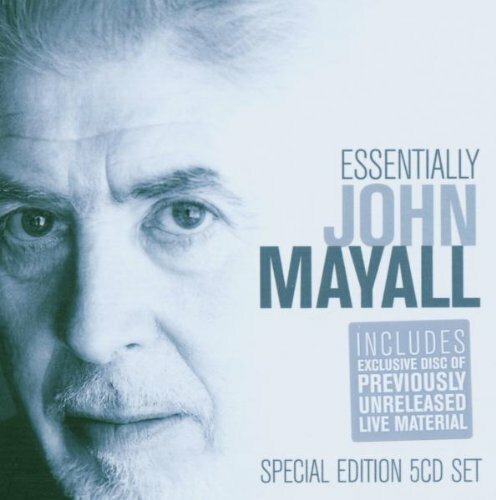 Essentially John Mayall includes four previous Mayall CDs—Padlock on the Blues, Along for the Ride, Stories, and 70th Birthday Concert—as well as a disc of “exclusive live rarities”. Four of the five discs feature Mayall’s band, the Bluesbreakers, and they sound great on the cleanly produced studio recordings, even if Mayall’s songwriting—especially on tracks like “When the Blues Are Bad” and “Kids Got the Blues”—is predictable. I’ve never been terribly thrilled by the guy’s tired-sounding vocals, either, but always put up with them to hear the accompanying players—people like Clapton, who wails away on a version of Freddy King’s “Hideaway” on the rarities CD. That same disc sees the fabulous Green doing six-string damage on a shabby recording of “Double Trouble”, the Otis Rush tune that Stevie Ray Vaughan named his band after. The more recent live material features primo Bluesbreakers guitarists Coco Montoya and Buddy Whittington and ranges from the ruggedly catchy “Mail Order Mystics” to the downright corny “Undercover Agent for the Blues”.